PracticeLink.com W INTER 2019 27 L E G A L M AT T E R S coverage. This option offers the most consistent and predictable coverage. It's important to note that the employment contract should specify the amounts of coverage — at a minimum, the amount of coverage per claim and the aggregate amount of coverage. These amounts should match what is either required by your state as minimum coverage or be reasonably sufficient for your area of practice. There is also the option to elect for greater amounts of coverage. 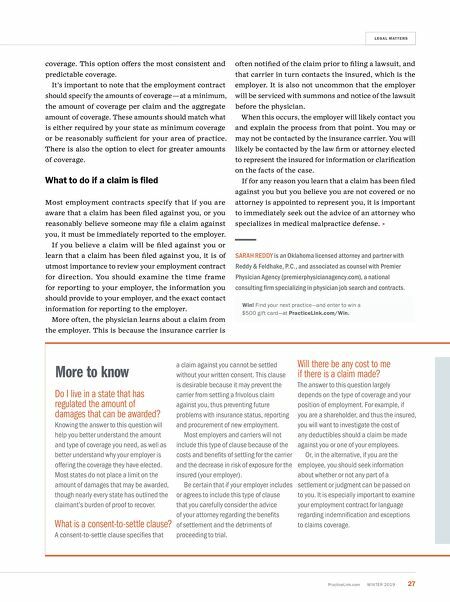 What to do if a claim is filed Most employment contracts specify that if you are aware that a claim has been filed against you, or you reasonably believe someone may file a claim against you, it must be immediately reported to the employer. If you believe a claim will be filed against you or learn that a claim has been filed against you, it is of utmost importance to review your employment contract for direction. You should examine the time frame for reporting to your employer, the information you should provide to your employer, and the exact contact information for reporting to the employer. 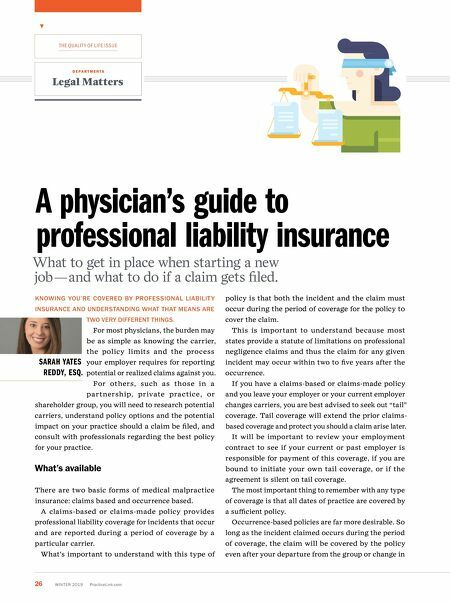 More often, the physician learns about a claim from the employer. This is because the insurance carrier is often notified of the claim prior to filing a lawsuit, and that carrier in turn contacts the insured, which is the employer. It is also not uncommon that the employer will be serviced with summons and notice of the lawsuit before the physician. When this occurs, the employer will likely contact you and explain the process from that point. You may or may not be contacted by the insurance carrier. You will likely be contacted by the law firm or attorney elected to represent the insured for information or clarification on the facts of the case. If for any reason you learn that a claim has been filed against you but you believe you are not covered or no attorney is appointed to represent you, it is important to immediately seek out the advice of an attorney who specializes in medical malpractice defense. SARAH REDDY is an Oklahoma licensed attorney and partner with Reddy & Feldhake, P.C., and associated as counsel with Premier Physician Agency (premierphysicianagency.com), a national consulting firm specializing in physician job search and contracts. Win! Find your next practice—and enter to win a $500 gift card—at PracticeLink.com/Win. More to know Do I live in a state that has regulated the amount of damages that can be awarded? Knowing the answer to this question will help you better understand the amount and type of coverage you need, as well as better understand why your employer is offering the coverage they have elected. Most states do not place a limit on the amount of damages that may be awarded, though nearly every state has outlined the claimant's burden of proof to recover. What is a consent-to-settle clause? A consent-to-settle clause specifies that a claim against you cannot be settled without your written consent. This clause is desirable because it may prevent the carrier from settling a frivolous claim against you, thus preventing future problems with insurance status, reporting and procurement of new employment. Most employers and carriers will not include this type of clause because of the costs and benefits of settling for the carrier and the decrease in risk of exposure for the insured (your employer). Be certain that if your employer includes or agrees to include this type of clause that you carefully consider the advice of your attorney regarding the benefits of settlement and the detriments of proceeding to trial. Will there be any cost to me if there is a claim made? The answer to this question largely depends on the type of coverage and your position of employment. f or example, if you are a shareholder, and thus the insured, you will want to investigate the cost of any deductibles should a claim be made against you or one of your employees. Or, in the alternative, if you are the employee, you should seek information about whether or not any part of a settlement or judgment can be passed on to you. It is especially important to examine your employment contract for language regarding indemnification and exceptions to claims coverage.